The winner of our Spirit of Youth Award at last year's Sunday Life Spirit of Northern Ireland Awards with Specsavers came through a traumatic time when she lost her little brother Thomas in an accident involving a JCB digger on the family farm, two years ago yesterday. Four-year-old Thomas was her best friend as well as her brother and little Emily, who was just eight at the time, stunned everyone when she decided that her way of managing was to support charity. In just over a year she raised a staggering £20,000 in memory of Thomas with two major fundraising events which she organised more or less single-handedly. The family from Maguiresbridge - mum Jacqui, dad David, four-year-old sister Luciana and Emily - all struggled with the loss of Thomas but keep his memory alive at home by talking about him every day. And Jacqui says she couldn't be prouder of her little girl who she described as an inspiration. Little Emily was with her mum when they arrived home to the tragic scene immediately after the accident happened on the family farm on April 6, 2017. Jacqui recalls: "We came across the accident so there was no such thing as breaking it to Emily gently. She saw the chaos. "We had just arrived home from a movie night at school and the ambulance and police were there. "Thomas had decided not to go to the movie night because he preferred to be outdoors and it was a beautiful evening and he stayed at home with his daddy. "It traumatised me, so at eight years of age it must have been a nightmare for Emily. Even the wake and funeral were so different to normal as we had so many people of all ages in floods of tears. I am sure it was scary for her. "Fundraising was her way of coping. She called it her strategy. "Thomas and her loved to bake buns and she asked in school if she could have a bun sale for the children, then she asked if the mummies and daddies could come and in the end it became a coffee morning. "She made the posters herself and thank you cards and set up the room in the school and was a real wee busy bee. "She made a speech at the coffee morning saying that Thomas had his wish every day when he came home and played outside which was something he loved to do and she wanted to help make wishes come true for sick children. " Hundreds from her local community turned up to support Emily's coffee morning in Maguiresbridge Primary School, helping her to raise over £8,000 for the Make a Wish Foundation. Encouraged by her success, she then organised a charity walk in Gortin on New Year's Eve 2017 - again supported by hundreds - and raised another £14,000. After winning our award last year, one of our readers was so touched by Emily's selflessness that she called at the family home and offered Emily a range of crafts she had made to sell for charity. Jacqui says: "Emily waited until near Christmas and sold the lot at a craft fair to raise money for the Northern Ireland Children's Hospice. "She wasn't a natural saleswoman but she persevered and stayed at the fair for three days until she sold everything. It was her wee way of dealing with Christmas. "There is so much excitement at that time of the year but not in every home and it was her wee way of dealing with facing Christmas without Thomas by thinking of other children. "The lady who donated the items came to our home after reading about Emily and her award in Sunday Life. "I have to say that the kindness and thoughtfulness of strangers has been overwhelming to us. "That lady has become a friend now and still calls at our home. It is just amazing how so many complete strangers have made an impact in our house and I think that is part of the reason why Emily is being so thoughtful - because she has seen the kindness of strangers. "Emily also knows that Thomas was such a kind and caring wee boy and we really are so proud of her." Mother's Day now is a tough day for Jacqui and little Emily is so sensitive to how others feel that she went out of her way to help her mum get through it last weekend. Jacqui says: "Mother's Day was such a hard day without Thomas. "Emily couldn't wait to give me a present and as she gave it to me she told me that she knew Thomas was looking down on us and was excited too that it was Mother's Day. "The loss of Thomas left such a huge hole in her heart and yet if she sees us upset she is full of hugs and kisses and is so sensitive and understanding. We are so proud of her. "Thomas is very much part of our house. He is talked about all of the time and he will always be with us." 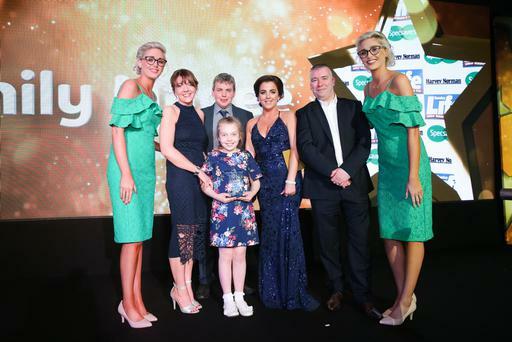 The Spirit of Northern Ireland awards gave little Emily a well-deserved boost and her mum was thrilled to see her daughter smile for the first time since losing her brother just over a year earlier. As well as being thrilled to get an award, little Emily who is a huge X Factor fan was delighted to get the chance to meet Louis Walsh at the star-studded event. One Direction star Niall Horan was so moved by her story that he sent her a personally-signed guitar which now takes pride of place in her home. Jacqueline adds: "Meeting Louis Walsh was the highlight of the night for Emily. She has a picture of her meeting him on her bedroom wall. "Emily is very modest and doesn't look for publicity but she loved the awards event. Her award has pride of place in our house."